I just added a button to the Explore Map and the pop-up map you see when geotagging your own photos from the photo page (organizer support v.soon). To get the button to show up you’ll need some form of geo-locating built-in/plug-in type thing, or maybe you’re all smarty-pants and running a cutting edge beta version of a browser with location finding built in already. Perhaps you’ve already installed Google Gears, in which case we’ll use that. 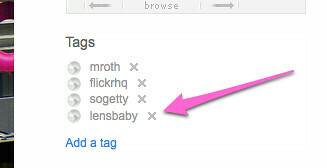 Probably the easiest way of getting the button to appear is to pop over to the Loki site and click the “Try it Now” button, install the plug-in, then pop back to Flickr. Loki is from the SKYHOOK Wireless peeps, who all the cool kids seem to be using. You can also click over to the Mozilla Labs and read more about their Geode project, about how location stuff will soon be built into browsers and everything and install their geode plug-in from there. Either way, it’ll check all three “things” and show the button if it finds one, as more options come along I’ll add those too. This is why you shouldn’t do graphical buttons and multi-language support at the same time. A slightly overdue (and longer than it was supposed to be) post, considering this happened a while ago, but I thought I’d mention a few subtle updates to the Places page. Meaning that from a photo that’s been geotagged you’ll be able to get more of a feel for the local area. Obviously this work better in large Cities where the neighborhoods themselves can be as big as towns, while in the towns you’re more likely to find the one or two photographers who count each neighborhood as their stomping ground. I guess that’s the big addition, but we also tweaked a few other things at the same time, here’s a before and after shot, you’ll probably need to click through to the larger size if you want to see the details. On the left side of each Places page we’ve moved different elements around, pushing the search further up, the date/time down and scrapping the weather altogether now that we’ve established that it rains in London. The functional changes over on the right involved moving the title, attribution, Next & Previous buttons off the photo. When we launched Places we didn’t have Videos, and now we do and the old position clashed with the video controls. The other benefit of the Next/Prev moving to above the photo is that they dont jump around as the photos resized. We also added key controls, now you can just press the forward and back cursor buttons on the keyboard to keep going through photos, power user tip! On a more technical level, now only geotagged photos appear on the Places page, and where possible the location shown on the map (sometimes with Neighborhoods, due to the nature of the beast, they can be just off the edge of the map). When we first launched the Places page we wanted to make sure that each location had plenty of photos, so we used a combination of geotagging and tags/description to automate the selection of them. Which lead to interesting results such as the city of Reading in England featuring a lot of photos about books (tagged reading, natch). Now that we have over 100 Million geotagged photos we’ve switched to “just” them. We also factor in the Season a photo was taken in to select the interesting ones, to give us a bit more change in the first photos you see and too keep them relatively, well, seasonal. We’ll probably tweak this again soon to get them to rotate even more often, but still working through that one. You can read more about how Dopplr (and therefor us) calculate the colour for a place over on their blog: In rainbows and Darker city colours. Finally, because I’ve gone on enough already, the old design used to have two rows of thumbnails under the main photo and a total of 72 photos, meaning there were 6 “pages” of thumbnails. When you got to the last page, that was kinda it, you couldn’t go any further. Instead there’s now just one row, but I bolted on the API, so it keeps trying to load more and more photos as you get close to the end of the current lot. Instead of just 72 photos for Los Angeles there’s now the full (currently) nearly half million 444,594 photos. And that’s the revised Places page.